In this project I aim to use cultural treaties – agreements among states that promote and regulate artistic, intellectual, and cultural exchange – as a historical source with which to explore the emergence of a global concept of culture in the twentieth century. Specifically, the project will investigate the hypothesis that this concept, in contrast to earlier ideas of civilization, played a key role in the consolidation of the post-World War II international order. The project examines bilateral cultural treaties from 1919, when the first such agreements were signed, to 1972, by which time such treaties regulated a fully global network of cultural relations. I approach these treaties as sources for the history of ideas, and as a data set, using computer-assisted quantitative analysis to analyze and visualize how these treaties contributed to the spread of cultural concepts and to the development of transnational cultural networks. In this digital part of the research I am supported by the good people of HUMlab at Umeå University. Research on this project is supported by a grant from the Swedish Foundation for Humanities and Social Sciences. I have conducted a preliminary methodological exploration, "Computer-Assisted Research on Cultural Treaties," available here. In March 2018 I attended the Digital Humanities Nordic conference in Helsinki, to present a paper called, "Charting the ’Culture’ of Cultural Treaties: Digital Humanities Approaches to the History of International Ideas." German pavilion (built 1938) in 2008. Photo by Moritz Bernoully, flickr, creative commons license. The Nazis deployed the arts as a form of cultural diplomacy, bringing international audiences into contact with approved works of German painting, sculpture, and architecture. At the same time, a particular idea of art—understood as a transcendent, non-commercial, non-political reflection of the spirit of the nation—played a crucial role in the Nazis’ broader effort to forge pro-German networks of foreign intellectuals and cultural producers in many fields. Like "science," the apparently neutral, objective, and autonomous category of "art" fulfilled valuable functions in the Nazis’ creation and maintenance of international networks. When the Nazis created international cultural institutions, such as the International Film Chamber (founded in 1935) and the European Writers Union (1941), these bodies deployed a depoliticised understanding of filmic and literary art in such a way as to remove these cultural fields from political contestation. The goal of this practice was, ironically, to mobilise these cultural fields for political purposes. Over time, this idea of art played an even more important role in the Nazis’ cultural ‘New Order’ than did actual exchanges of artists or works. Understanding why this was so requires a look at the ‘art’—in practice and as theory—of the Nazis’ international networks. I am currently completing an essay on this topic for inclusion in a book with Routledge, tentatively entitled A Treason of the Intellectuals?, edited by Maria Björkman, Patrik Lundell, and Sven Widmalm (based on papers from the 2016 symposium in Uppsala). This project explores the role that Venice—as city and as symbol—played in the international cultural politics of fascist Italy. Fascist officials brought foreign guests to Venice for a range of international intellectual and arts-related conferences and events from the 1920s to the 1940s. The fascists used Venice as a stage for the international presentation of the regime, deploying the city’s beauty and symbolism to enhance the legitimacy and prestige of fascist Italy in the eyes of foreign elites. Italian fascists used international conferences to establish Venice as a nodal point in emerging modern networks of cultural production and exchange. Internationalizing Venice in this way supported fascist Italy’s claim to a leading position in the transnational networks in the arts and letters that were becoming such a decisive feature of European cultural life. As a result of these efforts, Venice entered a new, dramatic phase in its long history as a site of cosmopolitan tourism and transnational commerce. It now became an “international city” in a new and distinctively twentieth-century sense, with lasting effects on some of the city’s most distinctive cultural institutions. Research on this project was supported by a grant from the Gladys Krieble Delmas Foundation. 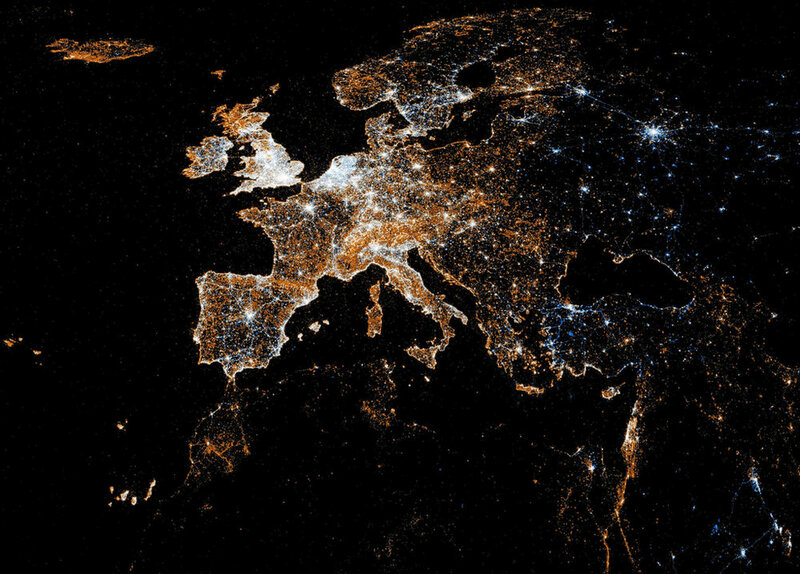 Eric Fischer, European detail map of Flickr and Twitter locations, via photopin.com, creative commons license. Ben Martin is a founding member of the U4 Research Network on "Cultural Mechanisms of Inclusion and Exclusion in Contemporary Europe" (CMIECE). Together with colleagues at Groningen University, Göttingen University, and Ghent University, Martin co-organized a kick-off conference at Göttingen in November 2015 in order to examine the ways "Europe" – as idea, as cultural point of reference, and as political concept – functions as just such a conceptual mechanism of inclusion and exclusion.